You may have noticed a new piece of public art hanging out on the corner of Capitol and North Main streets. 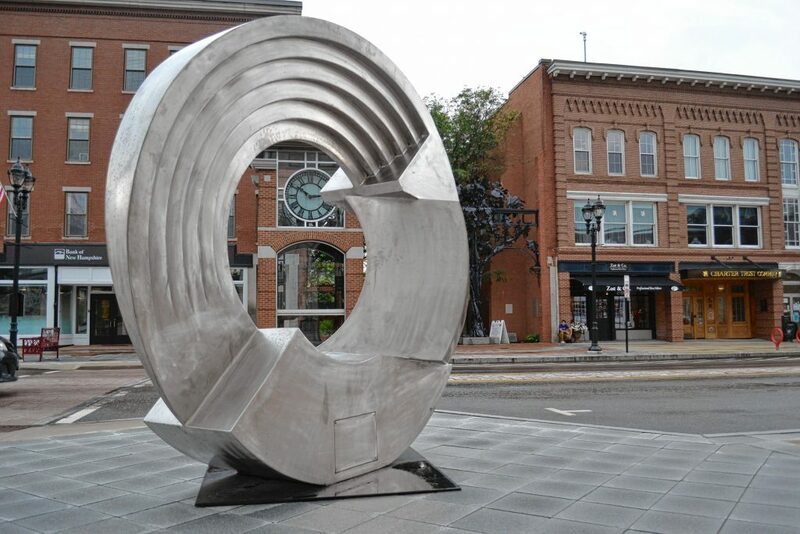 It’s the creation of Massachusetts sculptor Rob Lorenson and is known as Taper Deco. The large metal sculpture is pretty cool with both its smooth and tapered surfaces. If you tap on it (shh, you shouldn’t do that) it sounds hollow and you can almost make the case that from one angle it kind of looks like a C for Concord. And is just the latest work to make its Concord debut thanks to an partnership between the Greater Concord Chamber of Commerce’s Creative Concord committee and the city. Taper Deco was the second installation this summer – joining Toe Dancer, a pair of stainless steel dancers, by John BonSignore in front of the Kimball House at the Capitol Center of the Arts. In 2016, near the corner of Pleasant and South Main, the bronze boy holding a turtle, or by its proper name, A Moment in Time by Beverly Benson Seamans, was the first piece of public art in what has been a plan since the Main Street redesign. “The redesign was done with public art in mind. There were designated spots for it,” said Tim Sink, president of the Greater Concord Chamber of Commerce. In the fall of 2016, Bright One Morning by Murray Dewart was installed on North Main, at the top of Phenix Avenue right near The Works Cafe. “We had the spaces but then it was like ‘What are we going to put there?’ Sink said. Last year, nothing was added as the Big Bicycle Project took over North and South Main, but the city is back at it this year – and with more to come. “We hope to have two or three more installations this summer,” Sink said. Later this month, American Dog by Dale Rogers will be placed in front of the Prescription Center at 125 N. Main St.
“He said he just sold one to Bill Clinton,” Sink said. The city provides a $400 per year stipend to lease the sculptures (which is some cases only covers the cost to move it) and the artist gets exposure for their work. If the piece sells – which all of them are for sale – the city receives 30 percent commission to be put into a fund for future public art. Thanks to Pam Tarbell, owner of Mill Brook Gallery and Sculpture Garden, the committee identified specific pieces and artists for installation. “She has great connections with sculptors all over the country and especially the Northeast,” Sink said. And as you can see, it’s taking shape quite nicely. Sink said he’d love to see public art to pop up around others parts of the city (and has already scoped out a couple good ones on the Heights), but wanted to see how things went and were received on Main Street. “I think we’ve picked out some really cool pieces,” Sink said. “So I’d love to see us expand it.